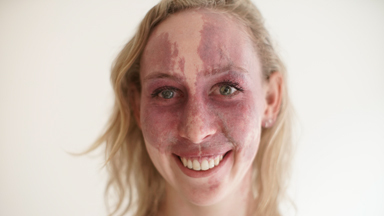 Grace Nesbitt, from Philadelphia, has suffered with cystic acne since she was in high school. Grace told Barcroft TV: “I realised I needed to embrace my acne and start falling in love with myself again. “I just didn’t like who I was and I knew there was good parts about me, but I couldn’t find them anymore. Cystic acne is often thought of as the most severe form of acne – it causes red, tender bumps under the skin and can be extremely painful. It is also the most difficult type of acne to treat. While Grace was in her senior year, she was prescribed an eight-month course of Accutane - a last-resort treatment which is controversial for its harsh physical and mental side effects, like peeling skin and depression. Her acne cleared after taking the tablets, but only temporarily. In the past six months, Grace says her break-outs have become “progressively worse”. She insists that she has tried different diets in attempt to clear her skin; gluten-free, dairy-free and general healthy eating. She has also tried exercising more, as well as undergoing tests to check for any hormone imbalances or allergies which could be causing her flare-ups. So far, she says, nothing has helped. Grace said: “A lot of people like to give their input or their opinions, or tell me what I should be doing. They think I’m not cleaning my face or taking care of my body correctly. “I changed my whole lifestyle because of the things people would say to me and that definitely impacted how I saw the world. I didn’t want to go out in public. She said: “I definitely think that I am trying to change the narrative of acne not making you ugly. “People say I inspire them, I help them go out without make-up on and I think I am doing good and sending some positivity to the world and it’s wonderful. Grace said that her acne and low confidence stopped her from enjoying life with her friends and forming relationships– especially in her 20s when everybody around her was going out. So as her next step towards embracing her skin, she agreed to going on a night out with her friends without make-up – something she hadn’t ever done before. She said: “It wasn’t until about a year ago where I just stopped going out at all. I lost all confidence. She added: “I am surprised I didn’t have a little bit of an anxiety attack. “I think I hid in my room for too long with my makeup on and now I am not as afraid to go out in public without makeup because that wasn’t even bad.